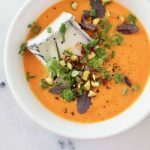 A healthy, quick and easy cream of carrot soup recipe from scratch, made without stock with rosemary, ginger or nutmeg and served with fresh herbs and goat cheese. Easily adapted to be vegan as well. Add the olive oil and butter to a medium heavy bottom pot on low flame. Add the onion and a pinch of sea salt and cook for a few minutes. Stir in the red pepper flakes, rosemary, sage, thyme, bay leaf, parsnip and carrots. Give everything a good stir to mix together and pour in enough water to cover everything. Bring to a simmer and cook for 15 minutes or until the carrots have softened. Discard the bay leaf together with the rosemary and thyme sprigs. Use a hand held immersion blender and puree the soup in the same pot until creamy and smooth. Add a little more warm water If a thinner consistency is desired. Add the cream and heat through. Stir in the nutmeg or grated ginger. Adjust seasonings to taste with sea salt. Ladle into bowls and serve with the goat cheese and fresh herbs on top. Garnish with the pistachios and more red pepper flakes.